If you're searching for a delightful gift that will fill the recipient's heart with happiness, look no further than this colorful and bright bouquet. 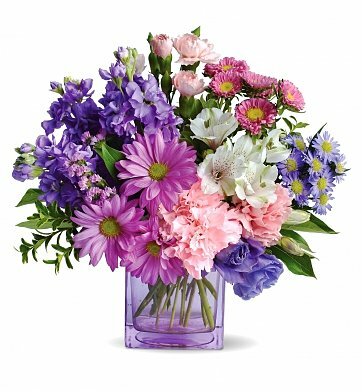 The pretty mix of flowers includes favorites such as alstroemeria, carnations, lisianthus, daisy spray chrysanthemums, matsumoto asters, and stock. Delivered in a modern cube vase, it's a heartfelt gift that's sure to delight. Arrives in a stylish glass cube. Measures approximately 14" x 15". Heart's Delight Bouquet is a hand delivered gift. These gifts are delivered by one of our local design centers located throughout the United States and Canada. Same day delivery is available for most gifts when ordered before the cutoff time. The cutoff time for Heart's Delight Bouquet is 2 PM in the recipient's time zone. The recipient sent me a picture of the flowers I sent and they were beautiful (and right on time)! Thank you! Thank you! Arrived on time and my mother LOVED the flowers! Thank you so much for the beautiful flowers and great customer service! Someone called me to confirm the location and room number. Very pleased, Thanks! This colorful bouquet was sent as a pick me up to a co-worker who was recovering from an illness. She said it was really pretty and felt better already. This was our first experience with gifttree. The ordering process was very easy; it arrived when we wanted it to, and we found customer service from this site to be excellent. These flowers were delivered to my mother in law who was just diagnosed with cancer. She loved them and still keeps on talking about how beautiful the arrangement was. Thank you for bringing some joy into her life. I sent this lovely bouquet to a friend recuperating from surgery. She's a gardener and the colors and quality of the flowers boosted her spirits instantly. I was very pleased with the quick delivery.